While some people may consider dog boots strictly the province of certain pampered city dogs, others realize the practical nature. 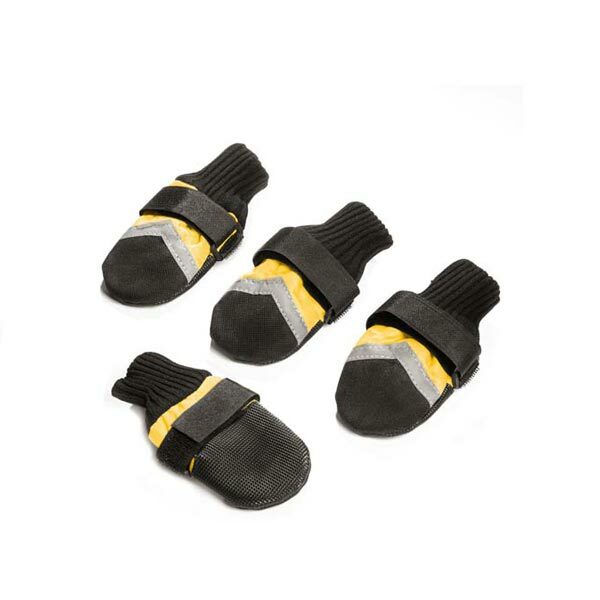 Frankly, dog boots protect your pet’s paws from extreme temperatures and other hazards like chemical de icers, salt and even hot pavement in the summer. Your pet may whine or seem unhappy about going outside because her paws hurt. Dog boots can make all the difference. But with so many styles of booties and shoes out there, how do you pick the best one for your pet? Many dog shoes focus on “cute”. They’re made to mimic human shoes and make you smile more than to protect your pet’s paws. Just as there are people shoes that are uncomfortable and impractical for many situations—hiking in stilettos anyone?—dog boots can be the same. Dog boots that focus on fashion may be uncomfortable for your pet. Plus, they don’t offer the support you want to protect your dog’s paws. Instead of buying doggie shoes that look like people shoes, choose ones that are a better “fit” for your dog’s paws. After all, dog paws have a different shape from human feet and hands. Why should their shoes be the same? Reinforced toe – you don’t want sharp toenails poking through and ripping the boot! Flexible sole – boots with a hard sole (like people shoes) aren’t comfortable for your dog. Some type of elastic band or collar at the top of the boot – this helps keep the dog boots snug to your dogs legs and keeps unwanted material like snow, sleet, etc. from getting down inside the boot. We find this style of dog boot works well. It’s good for all types of weather and is comfortable for your dog. Plus, it pairs well with the Snuggy Boots Suspender System. Yes, it may take a few minutes for your dog to get used to wearing boots. Put them on all four paws attach the Snuggy Boot Suspender System to each boot and adjust the elastic leg strap providing tension on each boot. at a time inside and get your camera ready because there will be some fancy footwork. After a few minutes though, most dogs get accustomed to the dog boots and like them just fine. What’s your experience with dog booties? We’d love to hear in the comments below.